This pond plant dies right back in autumn, then fresh new growth appears again in spring. 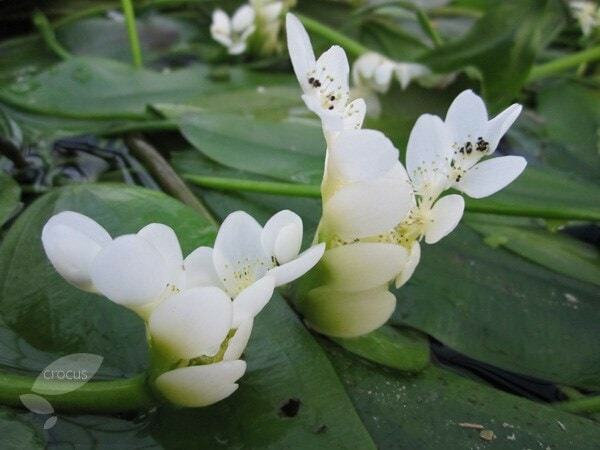 Originating in South Africa, this exotic-looking aquatic will usually flower twice a year. It has a summer dormancy, so is perfect for pairing with water lilies, which can take centre-stage while this one is catching its breath. After emerging from its summer dormancy, water hawthorn produces lots of paddle-like foliage and beautiful white blooms, which usually remain right up until the first frosts. In early spring it will usually start up again, giving another couple of months of colour. The flowers are edible and are said to be a delicacy in Germany where they sell them in tins. It will tolerate a little light shade, but for the best performance it should be planted out in full sun. Please note that the leaves and flowers may be damaged in transit, however the bulb is very robust, so (provided it is not in its summer dormancy) it will put on new growth quite quickly after being planted out. 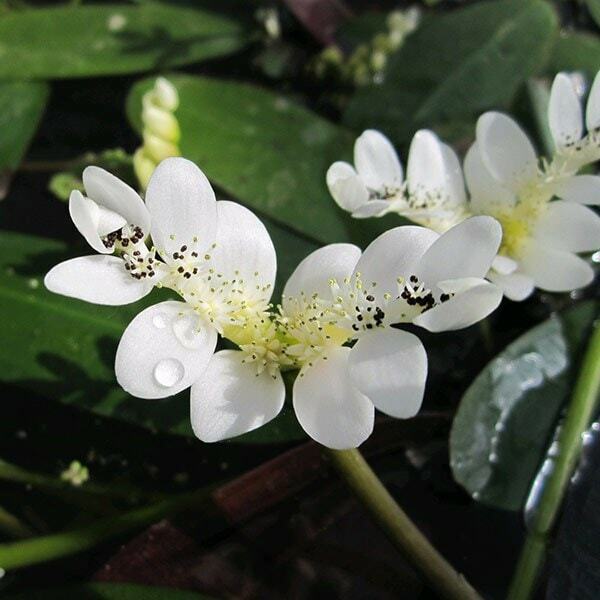 Garden care: This plant is potted up (using a suitable aquatic compost) into 1-litre aquatic pots. These pots are made of a fine mesh, which allows water to circulate through the compost, providing the plants with both oxygen and nutrients. As they are already potted, all you need to do is to place the pot into a pond. Initially the pot should be placed on a stack of bricks so the leaves float on the surface of the water. As the plant matures, remove one layer of bricks at a time, gradually lowering the plant deeper into the pond until the desired depth has been reached. We were advised to get one of these plants. From day one it bloomed and grew. It was still blooming at the end of the year. It is now resting but has doubled in size. This is a lovely pond plant but alas is now dead! I have just read on the RHS website that water snails love to eat it and will kill it. Most ponds will have water snails as they create a good balance for the eco system, so be warned as there is no warning on the plant description here. RHS abstract "Aponogeton distachyos (water hawthorn): Tuberous. Fragrant white flowers. Water snails will feed on this plant and kill it. Height 5cm (2in)"